I N S I G H T Marketing and Research Newsletter A S S O C I A T I O N P E N N S Y L V A N I A Volume 10, Issue 4 Summer 2017 INSIDE THIS ISSUE: Research Information Will Help Your Advertising Clients Make Better Decisions Page 2 Capture Fall Advertising Dollars Page 3 Will the New Changes Coming to Chrome Impact your Digital Advertising Revenue? Page 4 Increase Knowledge and Grow Advertising Revenue Through PNA Training Page 6 New Advertising Category- Specific Marketing Sheets! 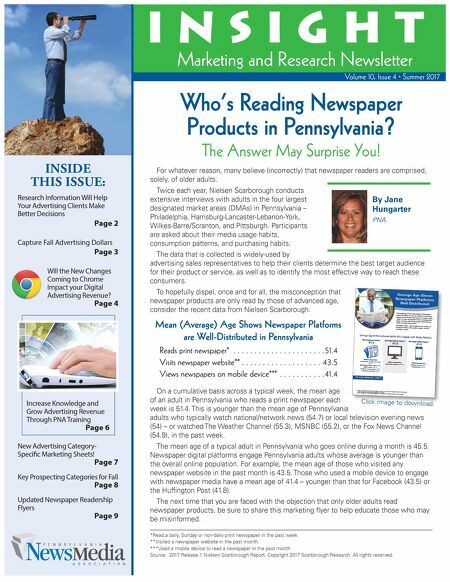 Page 7 Key Prospecting Categories for Fall Page 8 Updated Newspaper Readership Flyers Page 9 For whatever reason, many believe (incorrectly) that newspaper readers are comprised, solely, of older adults. Twice each year, Nielsen Scarborough conducts extensive interviews with adults in the four largest designated market areas (DMAs) in Pennsylvania – Philadelphia, Harrisburg-Lancaster-Lebanon-York, Wilkes-Barre/Scranton, and Pittsburgh. Participants are asked about their media usage habits, consumption patterns, and purchasing habits. The data that is collected is widely-used by advertising sales representatives to help their clients determine the best target audience for their product or service, as well as to identify the most effective way to reach these consumers. To hopefully dispel, once and for all, the misconception that newspaper products are only read by those of advanced age, consider the recent data from Nielsen Scarborough. On a cumulative basis across a typical week, the mean age of an adult in Pennsylvania who reads a print newspaper each week is 51.4. This is younger than the mean age of Pennsylvania adults who typically watch national/network news (54.7) or local television evening news (54) – or watched The Weather Channel (55.3), MSNBC (55.2), or the Fox News Channel (54.9), in the past week. The mean age of a typical adult in Pennsylvania who goes online during a month is 45.5. Newspaper digital platforms engage Pennsylvania adults whose average is younger than the overall online population. For example, the mean age of those who visited any newspaper website in the past month is 43.5. Those who used a mobile device to engage with newspaper media have a mean age of 41.4 – younger than that for Facebook (43.5) or the Huffington Post (41.8). The next time that you are faced with the objection that only older adults read newspaper products, be sure to share this marketing flyer to help educate those who may be misinformed. *Read a daily, Sunday or non-daily print newspaper in the past week **Visited a newspaper website in the past month ***Used a mobile device to read a newspaper in the past month Source: 2017 Release 1 Nielsen Scarborough Report. Copyright 2017 Scarborough Research. All rights reserved. Who's Reading Newspaper Products in Pennsylvania? The Answer May Surprise You! By Jane Hungarter PNA Mean (Average) Age Shows Newspaper Platforms are Well-Distributed in Pennsylvania Reads print newspaper* . . . . . . . . . . . . . . . . . . . . . .51.4 Visits newspaper website** . . . . . . . . . . . . . . . . . . . 43.5 Views newspapers on mobile device*** . . . . . . . . . . .41.4 Click image to download.